In his speech at the recent Hong Kong Trustees’ Association Conference 2013, the Secretary for Financial Services and the Treasury, Professor K C Chan, confirmed that the Government is keen to promote Hong Kong as a global center for trust services. Chan called the trust industry “an indispensable pillar that cements our standing as a premier international asset management center.” It offers a diverse range of services and products, including individual wealth and estate planning, as well as corporate trust services, such as trust administration and acting as a custodian. In addition, financial structures and products have been developed that utilize trusts, such as pension funds, real estate investment trusts and hedge funds. 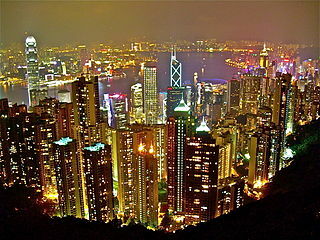 Hong Kong Skyline courtesy of Wiki Commons user Robster1983. He cited the many advantages that have set Hong Kong apart as a premier trust administration center. In particular, its proximity to the Mainland means the industry can offer its services to ultra-high-net-worth Chinese individuals who are seeking ways to manage their assets, as well as looking to preserve wealth and family businesses for passing on to future generations. The Government launched a trust law reform exercise in 2008, which sought to modernize the Trustee Ordinance and the Perpetuities and Accumulations Ordinance, the two main pieces of legislation in Hong Kong’s trust law regime. The exercise was brought to completion with the passage of the Trust Law (Amendment) Ordinance 2013 in July 2013. The Amendment Ordinance, which, he said, “will put Hong Kong’s trust law on par with those of other major comparable common law jurisdictions,” will come into effect on December 1 this year. Amongst other benefits, it will enhance trustees’ default powers and introduce a host of measures that can better protect beneficiaries. In the Government’s opinion, it should itself attract trusts to be set up in Hong Kong. In particular, through the abolition of the Rule against Perpetuities, settlors will be able to set up perpetual trusts in Hong Kong (which is still not possible in most major common law jurisdictions), and, through the introduction of the anti-forced heirship rule, settlors will not need to worry that the assets in the trusts would be clawed back by their heirs against their wishes in the future.